With the increase in Gonal F I feel more tired this morning. The dose went over two pens yesterday, so it should be 150 from one pen and 75 from the next. There should have been 150 left in the pen but is set it to 225 because the window should read the left over. It tells you what is left to inject with another pen. OH does the injection and instead of reading 75 the window reads 12.5. What now? Do we inject 75 as the maths tells us to or do we inject 12.5 as the pen tells us too. OH wasn’t comfortable potentially over or under dosing so we called the out of hours nurse (who got back to us so quickly) for advice. She said don’t trust the pen. It is best to work out the maths yourself and divide it over the two pens. I felt a bit silly calling up like it was an emergency but she said not to worry about it. Honestly, all the nurses and doctors at Homerton have been fab. 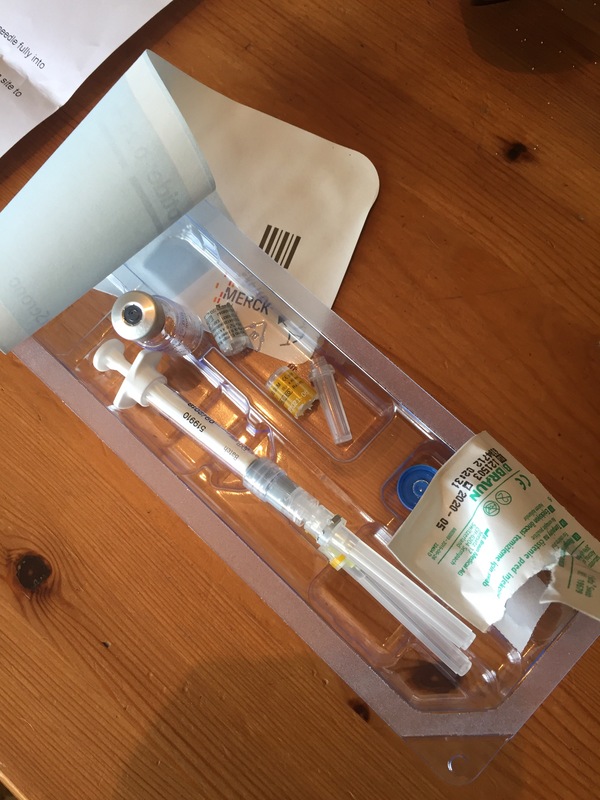 In 40mins time I will be injecting my stomach…. I thought it would be a good idea to feed the dog before the needle because he won’t be trying to jump on me during the process. I’m glad I gave him a bit extra with all the faffing about I did! We are going to have a fat dog and a fat me! It meant that when it came to the injection I had to just go for it, I could hear him licking the bowl ready to pounce. I’m quite proud of myself! Not only am I able to inject myself, which was causing a bit of anxiety, I did it independently and as a part of a normal routine. Yay me! I had my first acupuncture session today, I went to Kennington Osteopaths because they have a fertility expert. She knew exactly what was happening with my treatment and what effects the hormones would be having. I have to admit, I only really went because the forum people were talking about it as if it is expected. I didn’t really know anything about it. She did some work on my bloods because good blood is needed to make good eggs. I have to admit, I’m not sure how tapping needles into your body can move the chi or influence the energy but I’m still willing to give it a go. Just because there are no immediate effects doesn’t mean nothing is changing. The needles are hair thin so don’t really hurt at all. I did feel some tingling in different parts of my body as the needles went in, she put one in my knee and my breasts tingled! It made me giggle when I told her. I think I’m going to keep it up, I feel quite light headed at the moment (I’m on the tube home from the session), and it was nice to lie down for a bit. I think this will be an acumulative thing so the more I do it the better the effect will be. I won’t really know how successful it is until collection day and, even then, there is no way of proving the acupuncture helped. I’m sure there are studies proving the success rates, otherwise why would it be recommended? She did say when it gets to the hols she’ll recommend someone nearer to where I live, which is nice of her. This made me realise that this lady absolutely believes in the power of acupuncture, this helped me put my faith in her. I’m going to do a bit more research (as this session was £75!!! The rest will be £55) and I’ll let you know how it progresses.